I don’t remember a time when I didn’t love the weather. When I was five years old, I wrote my first words, “Partly cloudy”, in Ms. Benn’s kindergarten class. It’s been a love affair ever since, from teaching myself how to read forecast models at age 12 to landing here at WeatherNation. 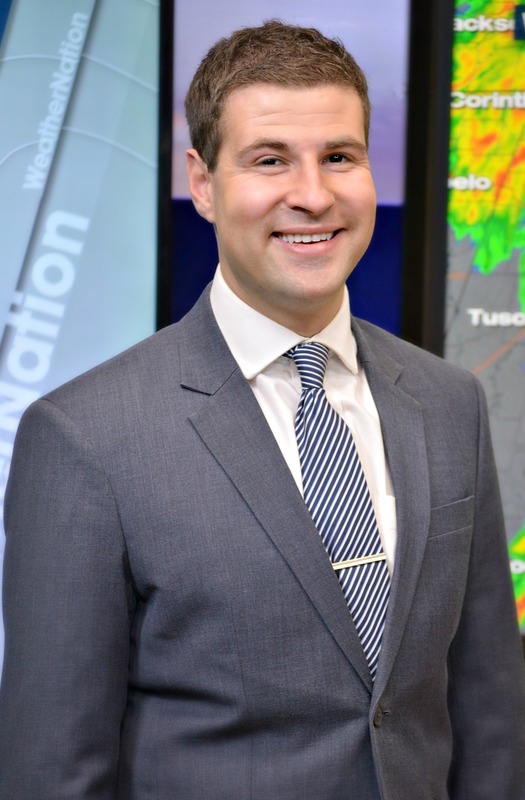 Growing up in Greenwich, Connecticut (nothing beats a good nor’easter), I started to truly go after my lifelong dream of becoming a meteorologist by predicting whether or not we’d have snow days – turning me into Greenwich High School’s defacto weatherman. I turned that snow day-predicting website into a front page story in our local newspaper, which in turn earned me a look at WABC-TV in New York, where I did the weather live on-air when I was 16. I attended Boston University, where I continued being a weather nerd, performing weather updates on the campus radio and TV stations and doing the daily forecasts for the student newspaper. Following my studies at BU, I worked at Mile High Sports and ESPN Denver for four years while pursuing my certification in Broadcast Meteorology from Mississippi State University on the side. I’m a huge sports fan – go Rockies, Nuggets, Broncos, Avalanche and UConn – and I’ll frequently find links between sports and weather, including an investigative analysis I did late in 2013 finding trends between Peyton Manning’s play and game time temperature (he doesn’t like the cold). I also enjoy running, playing any sport, socializing and periodically overeating at all-you-can-eat buffets. Without sounding cheesy, it's what I was born to do. I've never not known a time when I didn't want to be a meteorologist. So the answer is, I don't know. I won't ever forget calling my parents the Friday before Hurricane Sandy blasted metro New York (it hit on a Monday) and my hometown. We grew up right on the coast, and I told them this would be bad that Friday. Although I was in Denver during Sandy, I was on the phone with them all night as the storm surge neared our house (it didn't hit, fortunately) and as the winds knocked out power for five days. Sandy hit home for me. The images out of my hometown and New York were unlike anything I'd ever seen. I love sports- watching, playing, covering. I write for MLSsoccer.com on the side as a soccer reporter, and I'm fascinated by global politics and traveling. My dad is unquestionably my biggest influence. He likes soccer, geography and global politics. I probably try too hard to act like my Dad, aside from his English accent. Spanish is my first language. My mother was born and raised in Chile (earthquakes are of big interest to me) and my Dad was born in England but is of Chilean descent. Simply, to continue what we've done so well over the last 50 years: Increase warning times and continue to find innovative and entertaining ways to present a weather story to the average consumer.